Terry Zwigoff, Ghost World, 2001, 35 mm, color, sound, 111 minutes. 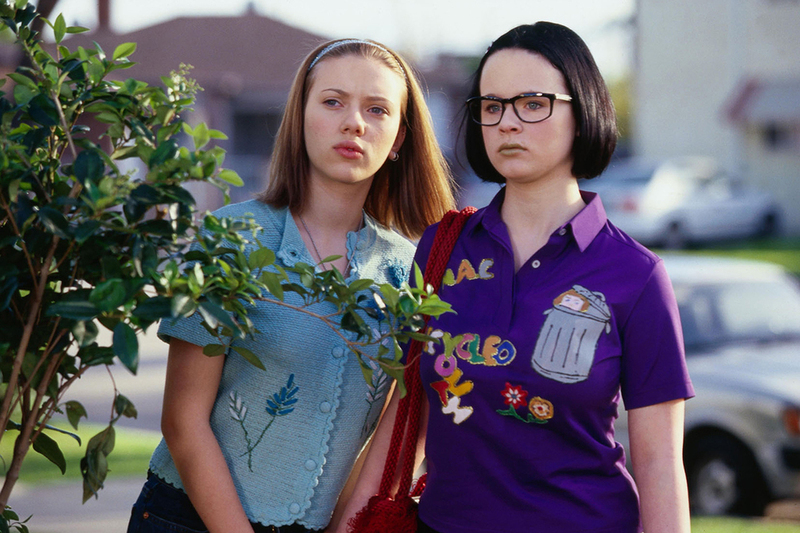 Rebecca and Enid (Scarlett Johansson and Thora Birch). AMONG THE NEARLY EXTINCT COMMUNITY of classic jazz purists, my uncle was relatively well known. Working under John Hammond at Columbia Records in the early 1960s, he produced the seminal reissue LP King of the Delta Blues (1961), a compilation of ’30s recordings by Robert Johnson that, along with Harry Smith’s Anthology of American Folk Music (1952) was a Rosetta Stone of the ’60s folk revival. His real love, however, was jazz, specifically early jazz—original Dixieland through the big-band swing era of the ’30s and early ’40s. He thought that bebop—the frenetic, highly improvisatory, small-band style of jazz pioneered by Charlie Parker and Dizzy Gillespie in the mid-’40s—killed the entire genre. Today, there are few moldy figs in the original jazz purist sense of the term, though an analogous pejorative, “rockist,” has taken hold in the past decade or so. A handful are still schlepping around, crates of dusty 78s in tow. 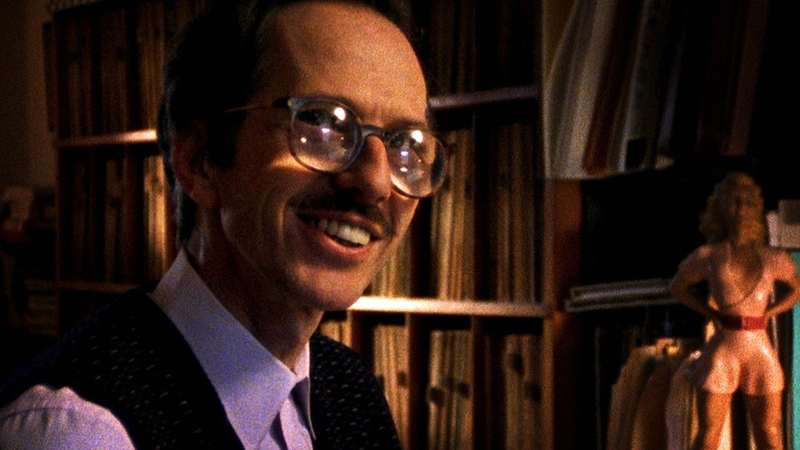 Film director Terry Zwigoff is one, as is his friend and the subject of his best film (and one of the greatest documentaries about an artist), Robert “R.” Crumb, the cranky godhead of underground comics. Marked by an obsessive urge to collect old records and acquire arcane knowledge, along with a singular inability to relate to contemporary consumer culture and participate in the cheery, transactional Human Resources mode of modern social interaction, moldy figs—unpopular even in their era—have never been more out of fashion. This is largely due to the internet, which has radically devalued the act of collecting, both in terms of objects (i.e., hard copies of bygone cultural artifacts) and specialized knowledge (connoisseurship, once admired and celebrated, has devolved into “knowing stuff makes you a snob,” as a friend of mine puts it). The low to nonexistent esteem granted to expertise, nostalgia, and obscurantism in twenty-first-century America makes the moldy fig an almost impossible figure, certainly an unwanted one. They are not welcome in a social-media environment where everyone is “connected” by means of “likes,” children are counseled to start developing their “brands” as soon as they leave the nursery, and predictably fraudulent vanity bonfires like the Fyre Festival actually attract large numbers of overpaying marks. Terry Zwigoff, Crumb, 1994, 16 mm, color, sound, 119 minutes. The Metrograph theater recently ran a Zwigoff retrospective, with the director present for questions after each screening, and I was eager to revisit his films to see how they would play in an era distinctly hostile to their concerns. They were largely as I remember them; none of them rose or sank significantly in my estimation. Crumb remains the standout, with Louie Bluie serving as a sweetly melancholic prelude to many of the later film’s themes, primary among them a longing for a sepia-toned, prelapsarian America that never really existed. The Clowes collaborations are consistent in tone but uneven in quality; Ghost World—a post-high-school coming-of-age tale based on Clowes’s graphic novel of the same title, featuring two female misfits growing apart in an unnamed, Sacramento-like city—is the far more effective and affecting movie. Both Clowes collaborations include moldy figs as main characters: Steve Buscemi’s crotchety Seymour in Ghost World (based on Zwigoff and, to a lesser extent, Crumb) and Max Minghella’s impossibly innocent freshman Jerome in Art School Confidential (a rare example of a young moldy fig, who worships Picasso, insists on representational work, and has little sympathy for or understanding of postmodern art). Despite similarities to their creators, both characters are treated harshly and have their lives effectively destroyed (though Jerome attains a strange kind of fame at the price of his freedom). This is consistent with the special sort of self-loathing that haunts moldy figs: Unable to appreciate contemporary culture or engage in normal human relations, the moldy fig turns on himself, as evidenced by Crumb’s more self-lacerating strips where he appears as a character. This can be harmful, even fatal. Crumb’s older brother Charles, who evinced a precocious talent for and obsession with drawing comics as a boy, particularly fan-fiction extensions of Treasure Island, was bullied by his explosive, domineering father and tough guys at school, eventually succumbing to schizophrenia and remaining a recluse for the rest of his life, living with his mother until he committed suicide in 1992. Robert Crumb credits Charles with inspiring him to become a cartoonist (partly by force when the boys were young). Crumb, which is dedicated to Charles and is almost as much about him as it is about Robert, contains the most chilling representation of the descent into mental illness I’ve ever seen. As he lost his grip on sanity, Charles’s self-drawn comics began to feature increasing amounts of text, the expanding word balloons crowding out the characters within the comic panels, eventually devolving into imageless graphomania, at first consisting of legible words but later just endless lines of squiggles. According to Robert, when Charles was growing up, he would often deflate people and situations by saying, sarcastically, “How perfectly goddamned delightful it all is, to be sure,” which could serve as the moldy fig’s credo. Such negative, contrarian attitudes have been unfashionable for so long in American pop culture that I was worried that Zwigoff would never receive funding for another film, so I was heartened to hear that his pilot for Budding Prospects, an adaptation of T. C. Boyle’s novel about marijuana farming, became available for streaming in March on, irony of ironies, Amazon.com.